The living room in our home is not too large, not too small… but just right. It’s cozy and inviting; the perfect spot for spending time with all the people we love (just not all at one time, of course!). As I began to refurbish the bachelor-esque living room after getting married, I was super excited to score a real lambs wool rug for just five bucks at our church’s youth flea market. I had literally been looking for months and months for one such rug. You can only imagine my glee as I stumbled upon this deal. So, to go with the long-awaited lambs wool rug I needed the perfect coffee table. One that wouldn’t take up too much space, or too much attention since I wouldn’t want the rug to be overlooked. One of the best ideas for a website in my opinion is that of Craigslist. Genius. On my hunt for the perfect coffee table I would frequent Craigslist just to see what’s out there for a great price. Alas, nothing was turning up. UNTIL one day when I was out of town in Atlanta on my first anniversary trip with my husband. I happened to be perusing the furniture section one afternoon as we were lounging about and THERE. IT. WAS. Just what I’d been looking for! 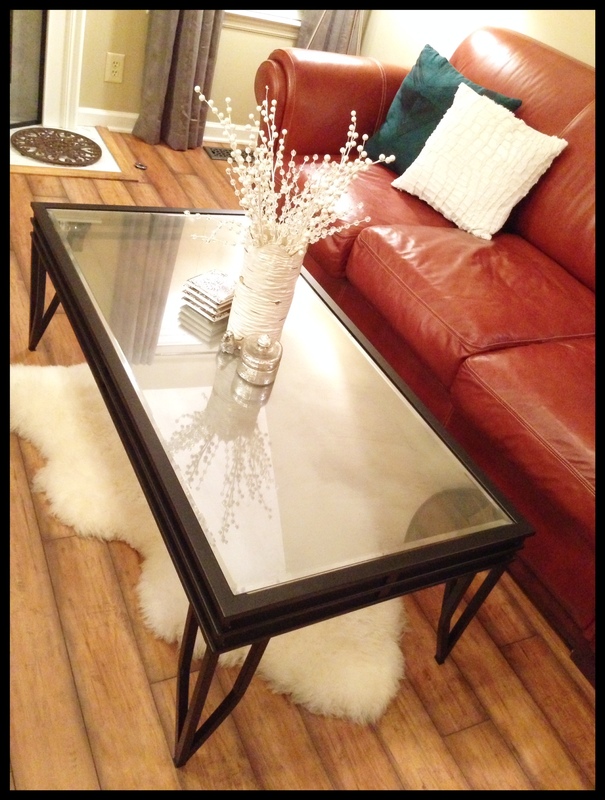 A not-too-bulky, metal and glass coffee table that I could diy a bit to make it my very own. Now, you know by now that I’m a bargain girl, so of course I was elated to discover that this table was just $20. But, remember, I was in Atlanta. Away from Nashville. Away from this newfound love of a coffee table. Fortunately, my parents live nearby and happen to be very generous with all things, and in this case specifically generous with their time. I called them up and told them about the deal and they traveled 45 minutes in the rain in Dad’s truck to a stranger’s house to hand off $20 in exchange for my new coffee table. Love them! When I returned home I could hardly wait to get to work on this little gem. I was specifically looking for a glass top table so that I could try out the Krylon “Looking Glass” spray paint that I’d discovered at Hobby Lobby. I took the glass outside and got to spraying. (Note: If, like me, you’re doing this process on a surface that is see through glass, spray the underneath side of the glass so that the paint doesn’t scratch when you set your trinkets on top of it.) I absolutely love the result. 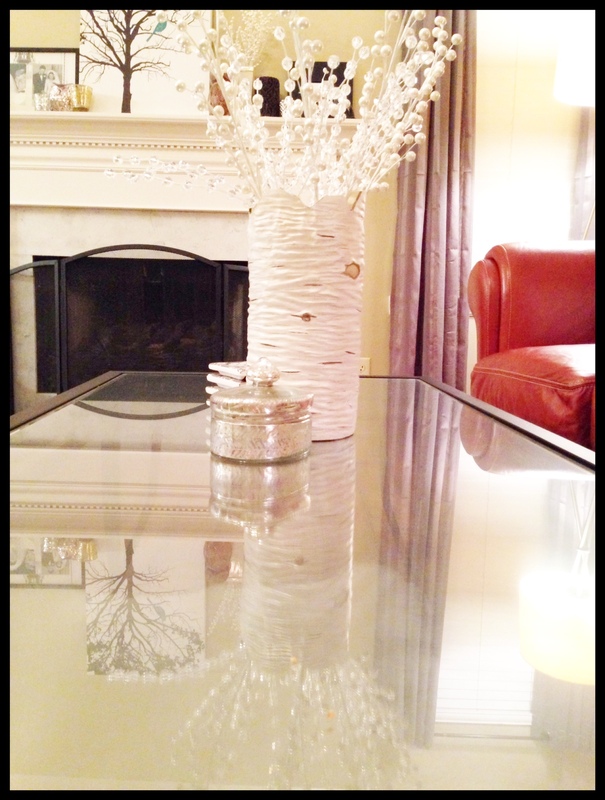 It’s reflective beauty against the black metal is the perfect match for the lambs wool it hovers over! I love it is there a tutorial? I have a table I’m nervous about trying this on! Lol I would looove to see a tutorial – even a live video of the transformation in action would help. Is the glass still transparent at all? Or after 3 coats has it become completely opaque? Hi Michelle! 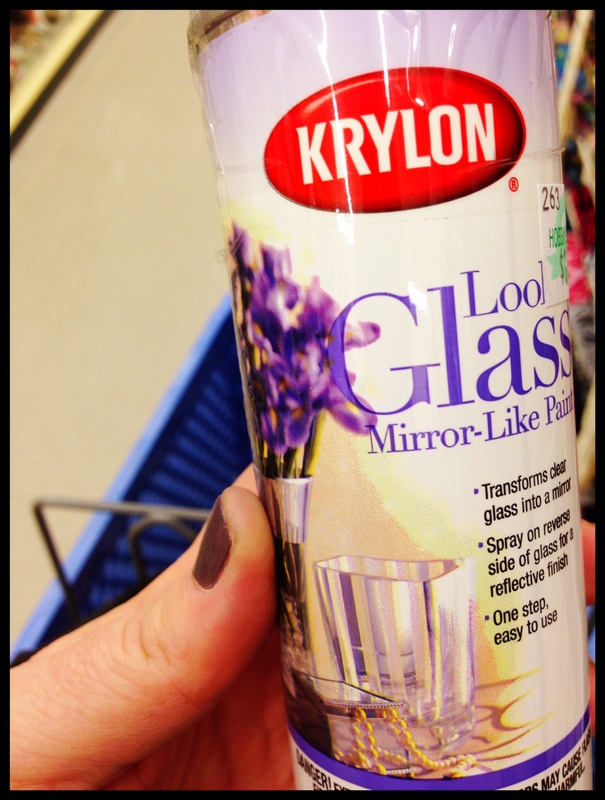 It’s super easy to use the Krylon Looking Glass paint! And, the transparency depends on how many coats you use. Using the 3 coats on my table, I can still see my puppy just a bit when he’s lying under the table. :) Here’s a video that shows examples of using this paint. The first example is for the mirrored look and she uses 5 coats: https://youtu.be/G-yjrTLsvSk. You can see the difference at the end of the video when she displays all of the examples. Hope that helps! Happy painting! Hi Melanie! You can use it on other materials that aren’t porous (such as metal, glass, etc.). And, although I purchased mine at Hobby Lobby, there are a myriad of other stores you can buy this product at (Home Depot, Lowes, Joann, etc.). Happy painting! I love this mirror spray paint. I usually put on three thin coats and two coats of black and seal it all with 2 coats of clear. It makes for a very durable mirror. I done the top glass on my desk and it has been three years and it still looks nice and bright. Pingback: Most People Think Spray Paint Is Cheap, But These 27 Projects Are Super Classy – Get Your Coffee Now !